At the context of “Revivification of Ancient Ruins”, in collaboration with the Cultural Association ARDITTOS, we present the urban performance “Reveries du Promeneur Solitaire: Stewart and Revett’s lost temple” by Hariklia Hari. The performance was held at the courtyard of the temple of Artemis Agrotera-Mets. 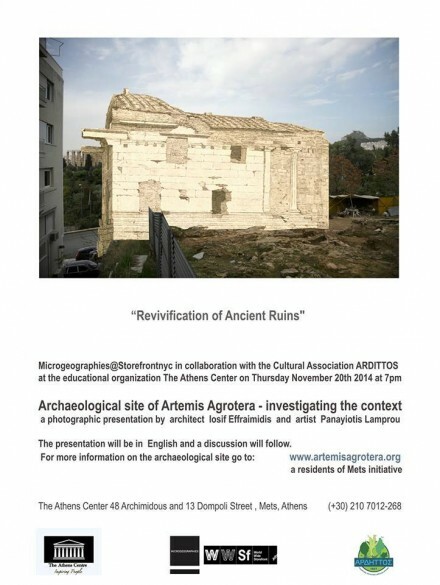 Microgeographies present ” Revivification of Ancient Ruins “: a unity of site-specific art works and public discussions, regarding the possibility of incorporating deserted archaeological sites in the everyday city life, starting from the remains of Artemis Agrotera Temple. At this context we presented the photographic presentation by architect Iosif Effrainidis and artist Panayiotis Lamprou titled: “Archaeological site of Artemis Agrotera, investigating the context”. The presentation was held at the educational organization “The Athens Center”, in collaboration with the Cultural Association ARDITTOS. A discussion followed. Microgeographies project focuses for the third time on the site of Artemis Agrotera Temple, one of the most important archaeological sites in Athens located in the area of Ardittos – Mets, at the block bounded by the streets Ardittou, Thomopoulos, Kefalos and Koutoula. The history of the temple is directly connected with the Athenian victory at the Battle of Marathon (490 BC), , and the cultural flourishing of the city of ancient Athens. In 1778, the temple was demolished and its material was used for the construction of the Ottoman fortifications around Athens. On 06.17.2014 the 3rd Ephorate of Prehistoric and Classical Antiquities of the of the Greek Ministry of Culture announced that in the East part of the site they discovered the foundations of a second temple dedicated to “Zeus Meilichios” . Reference to the temple of Zeus is made by Pausanias and the new discoveries confirm its topography at the site. Today this particular archaeological site is fenced and invisible from the road, and is an archaeological-urban void in the area. Microgeographies contribute to the need of the local community to incorporate the Mets archaeological site in the everyday life of the neighborhood, and to their will to point out its importance as a local and international historic site. 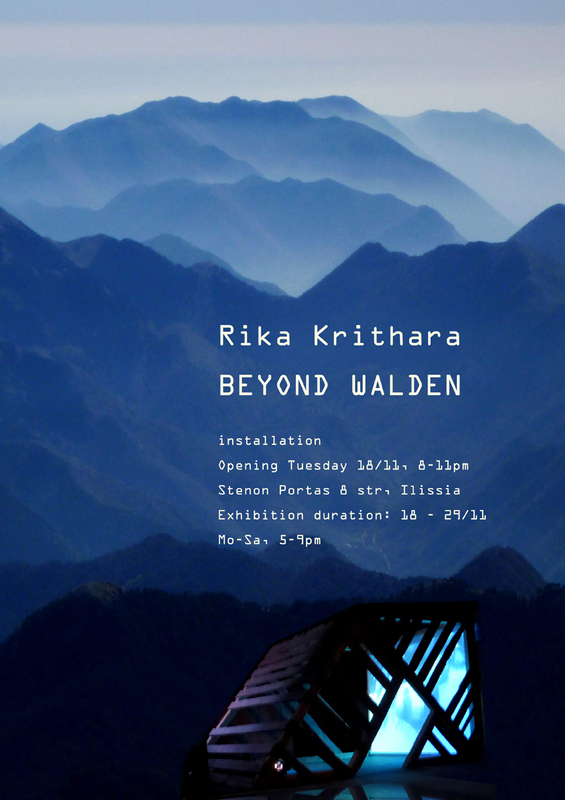 Beyond Walden (on Thoreau’s Cabin) is a site specific installation (video/sound installation, wooden cabin) by Rika Krithara: “Based on Thoreau’s cabin, an installation about the safety of the shell. Constructing collectively a deserted, sinking cabin inside an abandoned architectural office, habitation widens negating the protective shell of a clear, expected structure. The potential of a fixed point of philosophical and poetic isolation transforms: the possibility of freedom is everywhere, in the infinity of the horizon. All possibilities are open – a vast space, this is “Walden”. Today the archaeological site of Artemis Agrotera is fenced and invisible from the road, and is an archaeological-urban void in the area. Microgeographies present ” Revification of Ancient Ruins “: a unity of site-specific art works and public discussions, regarding the possibility of incorporating deserted archaeological sites in the everyday city life, and contribute to the need of the local community to incorporate the Mets archaeological site in the everyday life of the neighborhood. 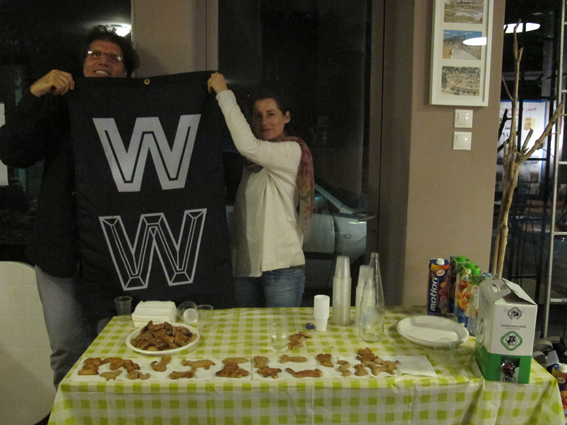 The following events were performed in collaboration with the Cultural Association Ardittos. 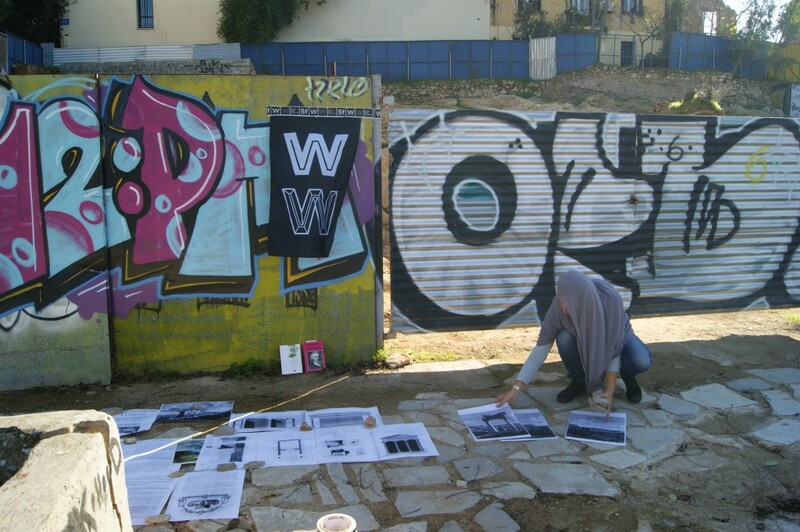 On Sunday November 9, at the site of Artemis Agrotera, we interacted with the two site-specific works by the artists Marianna Lyra (in collaboration with residents of Mets) and Nikos Stathopoulos. 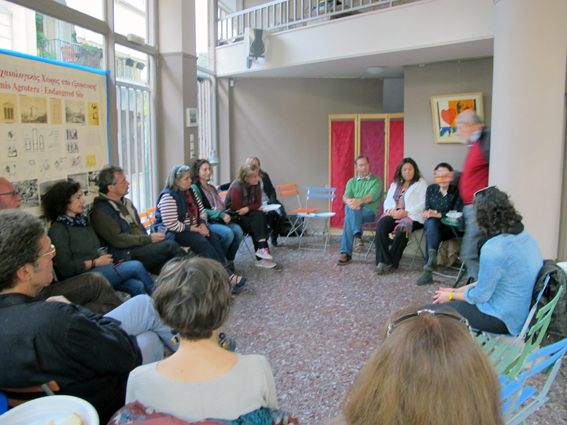 A discussion followed at the space of “Ardittos”. 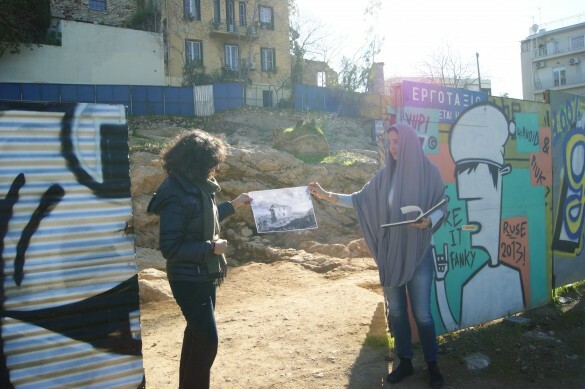 Microgeographies project focuses for the third time on the site of Artemis Agrotera Temple, one of the most important archaeological sites in Athens located in the area of Ardittos – Mets, at the block bounded by the streets Ardittou, Thomopoulos, Kefalos and Koutoula. The history of the temple is directly connected with the Athenian victory at the Battle of Marathon (490 p. Ch. ), the Marathon race, and the cultural flourishing of the city of ancient Athens. 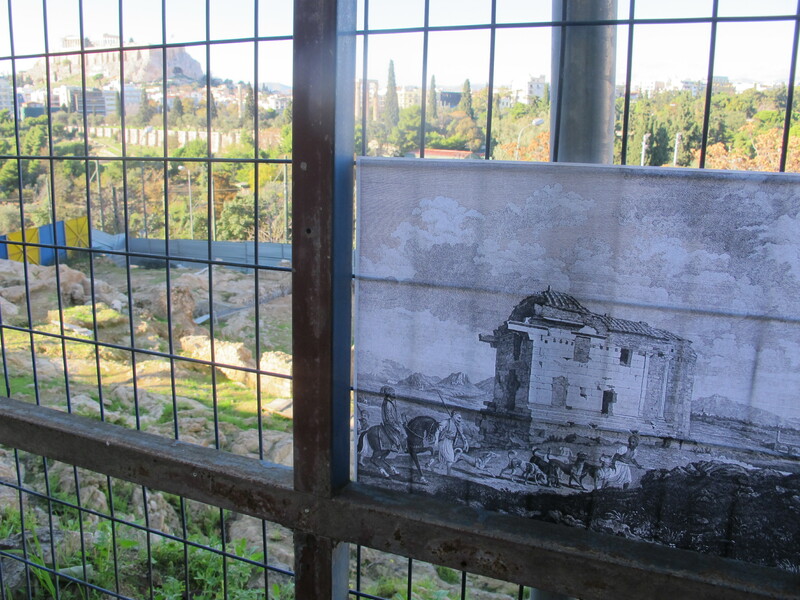 In 1778, the temple was demolished and its material was used for the construction of the Turkish wall around Athens. On 06.17.2014 we were notified by the 3rd Prehistoric and Classical Antiquities Archaeological Service, that in the western part of the site was excavated the foundation of a second temple dedicated to “Zeus Meilichios”. Reference to the temple of Zeus is made by Pausanias and the new discoveries confirm its topography at the site. Today this particular archaeological site is fenced and invisible from the road, and is an archaeological-urban void in the area. 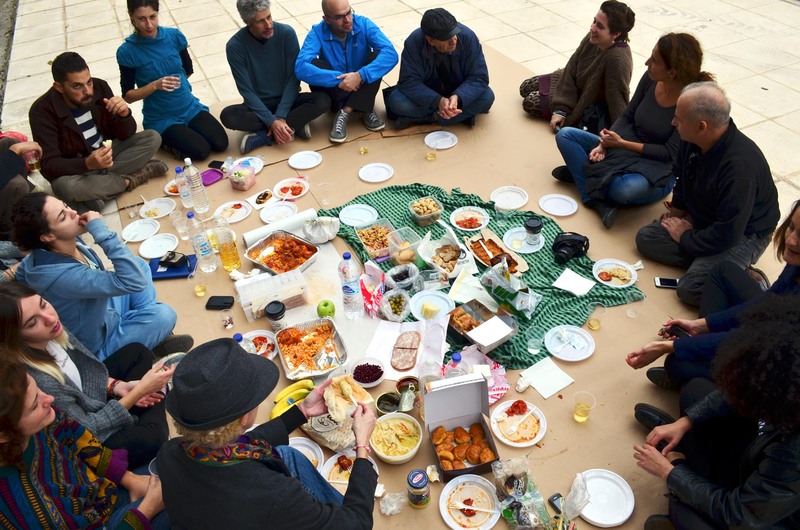 Microgeographies contribute to the need of the local community to incorporate the Mets archaeological site in the everyday life of the neighborhood. And to their will to point out its importance as a local and international historic site. 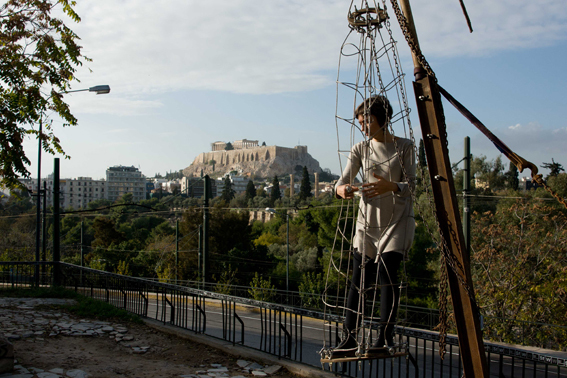 (A) 12.30-2.30mm, at the side of Ardittou Street (the elevated part of the pavement that forms the courtyard of the temple of Artemis Agrotera): “Rising”, an interactive performance by artist Nikos Stathopoulos. Rising is an interactive work where the artist is experiencing the urban environment suspended from a flexible metal cage. The viewer can participate in the process. The art work enables the viewer to find the height of the temple of Artemis Agrotera in classical times. From there the viewer will simultaneously have the ability to see inside the fenced site on one side and the important monuments of the neighboring region (Temple of Olympian Zeus, Acropolis view) on the other side. The “Procession” urban mural by artist and resident of Mets Marianna Lyra . We refered to examples delineated and actions made in this and other sites. We deepened in the concept of the archaeological site and its relationship with the urban and natural landscape. And we asked again for the current relationship between the landscape of Attica with modern planning and private interventions. A+B, two site-specific works by the artists Marianna Lyra (with residents of Mets) and Nikos Stathopoulos. C, discussionat the space of the local cultural association of “ARDITTOS”. At the context of Microgeographies’ Reveries and Realities research trip, we performed the second (1) public reading of the funeral oration of Pericles. The public performance was held on October 31, 2014, at 19.45, at Demosion Sema, the public cemetery of the ancient city of Athens. In his famous speech, known from Thucydides’ History of the Peloponnesian War, Pericles addresses issues on Democracy and Polis. The speech was delivered by Pericles at this site. Our reading was based on the History of the Peloponnesian War, Book Two, by Thucydides (translated by Eleftherios Venizelos). It was performed with the contribution of Orizontas team, artists, architects, archaeologists and random passers. We thank Yianni Besko, Jimmy Efthimiou, Hariklia Hari, Niko Kazero, Maria Peteinaki, Angelo Skourti, Helen Stefanopoulos, Yianni Theodoropoulo, Eleni Tzirtzilaki, Yorgo Tzirtzilaki and all the random passengers for their contribution. (1) Microgeographies first public reading was held at the context of the project Reveries du Promeneur Solitaire, on March 1rst, 2013, at 21.45. It was performed with the contribution of Orizontas team, artists and random passers. The performance was registrated and enriched at the Temporary office for the study and the registration of the “findings” of the reverie at the auto organzed space of Orizontas. 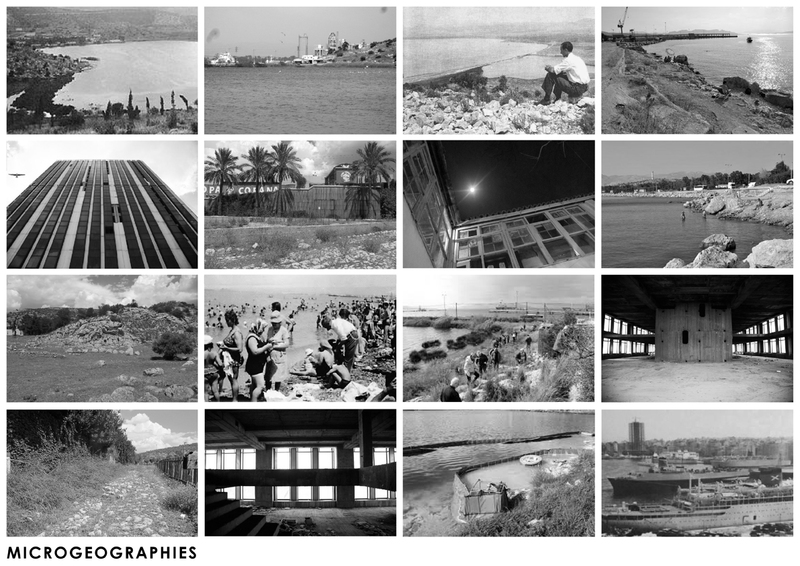 At the context of World Wide Storefront, Microgeographies present “Reveries and Realities”: a unity of projects and routes, personal and collective, regarding the lived experience of deserted places, starting from the remains of the ancient Sacred Way and ending at the coast of West Attica-Chaidari and Piraeus. 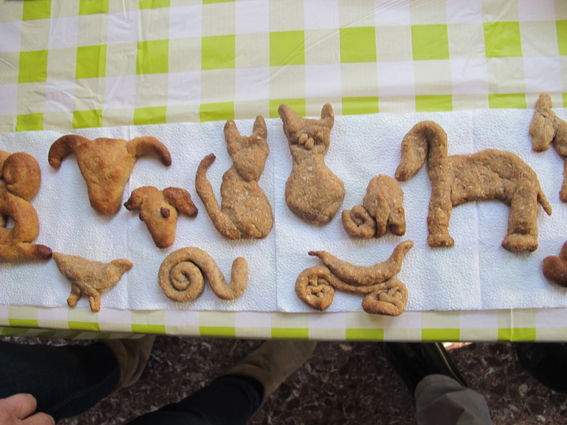 This research and experiential trip lasts two days: October 31 and November 4. In collaboration with the Environmental Association OIKO.POLI.S and the auto organized space of Orizontas. On October 31 we will perform a daily trip that is based on the ancient “Iera Odos” route. Iera Odos was “The Sacred Way” from Athens to Eleusis. It covers a distance of 22 km, still tracable at parts. We will pick up some of its characteristic remaining traces and corresponding sites. We have divided our tour in two routes: one in the western area and coast of Athens (Chaidari, Skaramaga) and the other in the center of Athens (the area where the road starts at Kerameikos). (2-6p.m.) In collaboration with the Environmental Association of Chaidari OIKO.POLI.S, we will visite Aphrodite’s Sanctuary (located today in Aphaia Skaramagka, a neighborhood of Chaidari), Iera Odos (in front of the CopaCopana recreation park), Reitoi (Koumoundourou Lake) and Skaramaga Coast. Our tour starts at the Sanctuary of Aphrodite where Yiannis Theodoropoulos sets up a temporary sculpture and Hariklia Hari, interacting with the site and the sculpture, presents the performance “Ophelia II: the loss of libido” (from “Reveries du Promeneur Solitaire” work in progress). 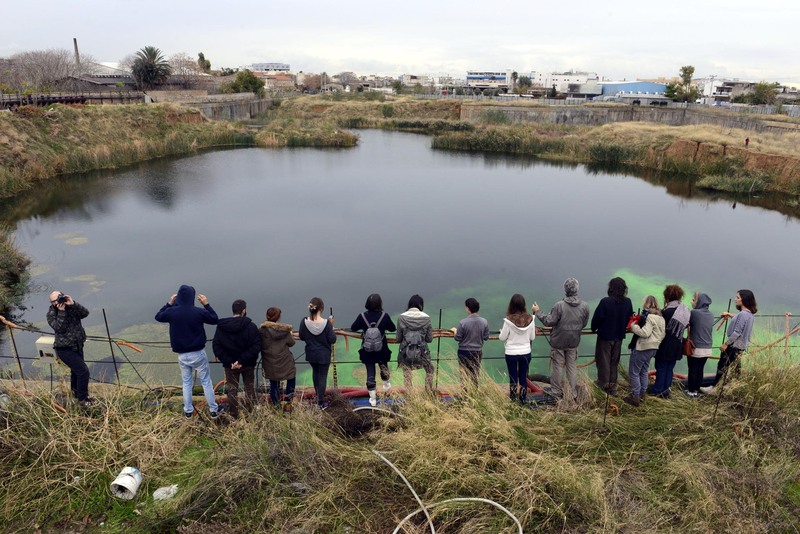 OIKO.POLI.S Association carries an environmental tour around the history and reality of the area and the particular sites.With the participation of architects, artists and people from the local community. The Sanctuary of Aphrodite at Skaramagas. Pausanias mentions a temple of Aphrodite, located today in Aphaia Skaramanga, a neighbourhood of Chaidari, about 1.5 km west of the Daphni Monastery. The monument was located via the many niches carved on the Aigaleo mountain slope, also noted by the French author Gustave Flaubert (1821-1880) on Christmas 1850. The sanctuary of Aphrodite was also a basic stop of the Eleusinian procession. D. Kampouroglou, the first excavator of the site found statuettes of Aphrodite and other gods, some reflecting the art of the school of Pheidias. He also located traces of a stoa, an altar, living quarters for the priests and the base for the statue of the goddess. In the 1930s, I. Traulos and K. Kourouniotis concluded the excavations. The sanctuary has a roughly rectangular enclosure wall (71×21 m), with an entrance and propylon to the south. There was a very small, almost square temple, with a doric portico and marble roof, on the west side of the wall. There is also a stoa and other buildings of unknown function. There are many bases of statues and votive inscriptions to Aphrodite, as well as altars and other votives, mainly clay figurines depicting the goddess, or vulvae and birds, the symbols of the goddess. It seems that the whole area of the sanctuary, including the niches would have been full of votive offerings, including statues, stelae, large vessels etc. A complex to the south probably served as residence area for both priests and travellers. A rectangular guard house (25×15 m) lies south of the Sacred Way. Two later sarcophagi testify to its funerary re-use. The exact establishment date of the sanctuary is unknown, but it should not be earlier than the 4th century BC. The sanctuary lived until the Roman times and is today open to the public. The Sacred Way (Ancient Greek: Ἱερὰ Ὁδός, Hierá Hodós), in ancient Greece, was the road from Athens to Eleusis. It was so called because it was the route taken by a procession celebrating the Eleusinian Mysteries. The procession to Eleusis began at Kerameikos (the Athenian cemetery) on the 19th Boedromion.In Greece today, the road from central Athens to Aegaleo and Chaidari (the old route to Eleusis) is called the Iera Odos after the ancient road. Roads connecting ancient towns to important sanctuaries, such as Athens and Eleusina were named «sacred». The official name of the Athenian Sacred Way was «Eleusinian», according to incriptions. It was assumingly established in the Late Helladic period(1600-100 BC) for reasons of communication between the settlements of Athens and Eleusina. The cult of Demeter is dated to the 11th century BC or earlier. By the mid 8th century, the use of the Sacred Way had been well established. Eleusina became part of the Athenian state in the second half of the 6th century, during the Peisistratid tyranny. The sanctuary acquired new buildings and the Sacred Way was remodelled and stayed in use throughout Antiquity.The sanctuary declined with the gradual rise of Christianity and the severe imperial decrees against paganism in the 4th century AD. Finally, Alaric’s Visigoths sacked the place in 395 AD and turned it to ruins. Nonetheless, the Sacred Way continued to link Eleusina and the surrounding villages to Athens. Many parts of the ancient road remained visible in the 19th century. Parts of the ancient road have been exposed at Kerameikos and at the plain of Kephisos river, such as in front of the 9th Primary School at Chaidari. Road terraces are built with stone boulders set on the natural chalk. The lower road surface layer is the bedrock with artificial chalk soil fill for natural cavities. The middle layer is a fill of chalk soil and small boulders. The upper layer is cobbled. There are intermediate layers of sand and gravel. Another major part of the road has been exposed further to the west. Smaller parts have been located to the east too, within the Chaidari municipality. A great and well preserved part of the Sacred Way has been excavated close to the sanctuary of Aphrodite at Aphaia Skaramanga, while many more but shorter parts have been exposed from there to Eleusina. The average road width is 5 m. Rocky slopes, such as the Echo hill (today Kapsalonas hill, on the northeast foot of Mt Poikilo), were dug out, while downslopes were terraced in order to support the road. In sandy areas, such as around Lake Koumoundourou the underlayer was cobbles and soil. The part in front of the Sanctuary of Aphrodite preserves wheel furrows. Reitoi (Koumoundourou Lake). Reitoi were two small artificial lakes on the west foot of Mt Aigaleo. Their springs were in natural cavities, which were blocked in antiquity. The stream outlets to the sea were crossed via bridges. Before these works the place had been a swamp and impossible to cross. The water had salt, due to its proximity to the sea. The north lake was devoted to Demeter and the south to Persephone. The latter is preserved until today and is called Lake Koumoundourou. It marks the border between Chaidari and Aspropyrgos, and it used to be the boundary between Athens and Eleusina. I. Traulos recognized that some of the building blocks of the dam came from the Peisistratian sanctuary at Eleusina, which was destroyed by the Persians in 479 BC. An inscription of the Athenian Boule of 421 BC, now in the Museum of Eleusina, mentions the construction of a bridge 1.5 m wide, hence for pedestrians only. Both streams and lakes had been preserved until the 19th century and featured two water mills, noted by François Pouqueville, while Gustave Flaubert saw only a swamp. Until the 1950s both lakes were natural fish reserves. The south lake was named either after the local land owners, or prime minister Alexandros Koumoundouros (1817-1883), responsible for road building in the area during the 1860s. The post-World War II widening of the national road reduced the size of the lake significantly. The north lake, Kephalari, was backfilled during the construction of the oil refinery at Aspropyrgos. Its place is today marked by a swamp. Skaramaga coast is situated on the east coast of the Bay of Eleusis. The Aigaleo mountain to the east separates it from Athens and Piraeus. Skaramagkas is 5 km west of Chaidari town centre and 11 km west of Athens city centre. Greek National Road 8 passes through Skaramagkas. Skaramagkas coastal line held a magnificent scenery with a popular seaside. We have plenty of description from poets and travel writers. It became an industrial area. Since 1937 Skaramagkas harbour has been home to a shipyard of the Hellenic Navy. After destruction in World War II, it was refounded as a commercial shipyard in 1957, the Hellenic Shipyards Co.. In 2002, the port became entirely owned by a German group of investors under the industrial leadership of Howaldtswerke-Deutsche Werft, which became a subsidiary of ThyssenKrupp in 2005. (7-11p.m) In collaboration with the auto organized space of Orizontas Gegonoton, we will visit Demosion Sema in Kerameikos in order to perform a public reading of Pericles’ Funeral Oration at the place that was initially delivered in ancient Athens. In his famous speech, known from Thucydides’ History of the Peloponnesian War, Pericles addresses issues on Democracy and Polis. The reading will be followed by in situ discussion on the topic “The city of Athens is us, the Athenians”. Then visit the auto organized space of Orizontas Gegonoton, one corner down at Plataion & Kerameikou str. Οn the occasion of the presentation of the ongoing project “Invisible Islands”, a cultural trip in the aegean islands, we will adress on issues relevant to landscape strategies, sustainable tourism and the new coastal law in Greece. .
Demosion Sema”, the public cemetery of the ancient city of Athens, extended just outside the Dipylon gate. The graves were constructed along the sides of the road which became very wide (up to 40 m.) outside the walls. A part of the “Demosion Sema” cemetery has been brought to light in 1997, during a rescue excavation. The Public Sepulchre (Demosion Sema) came into existence along the road which ran from the Dipylon to the Academy, covering a distance of aproximately 1,500 m. At its beginning the width was as much as 40 m. Apart from scattered references in the ancient sources, there is the extensive description of Pausanias (I, 29, 2-16) of the 2nd century A.D. Here were the graves of public figures such as Solon, the tyrant slayers, Kleisthenes, the democratic leader Ephialtes, Perikles, the rhetoricians Euboulos and Lykourgos, the philosophers Zenon and Chrysippos, and generals such as Phormion, Thrasyboulos and Chabrias. In addition there were so many common graves (polyandria) of those who had fallen in war that the Demosion Sema gave the impression of being a military cemetery. The use of the area as a cemetery, with burials at public expense, is in evidence from the time of Solon. The systematic common burial at public expense of those fallen in war appears to have been regular practice from the time of Kimon. Both common burials and burials of public figures continue in this place at least until the 3rd century B.C. During the official ceremony of burial, honours of immortality were given to the heroes fallen in war whose bones had been brought to Athens from the field of battle. Games were held, a funeral speech was delivered and the state undertook the care of their families. Stelai were erected over the graves with the names of the fallen according to tribe (phylai). Despite numerous excavations in the area during the past 40 years, and the location of many sections of the road, none of the important burial monuments had been found other than the few included in the archaeological site of the Kerameikos. Orizontas is a typical old Athenian two floor house. It has a central courtyard with rooms all around. It was a ruin, as most of the old neoclassical small houses in the areas of Kerameikos. 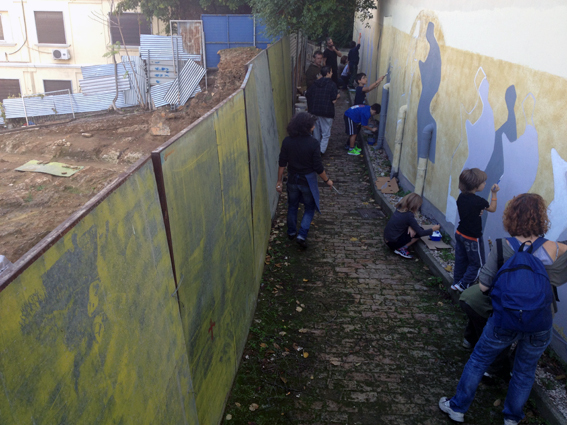 With the collaboration of the local community, the Orizontas team transformed the building into an open cultural space. Manolis Economou calls us to a tour-experiential action in “Skyscraper”: The building known as Tower of Piraeus, is a ghost building that stands in the port of Piraeus in the early 70s unfinished. Urban legends are connected with its existence. Trully, what is the real position in the history of the city? 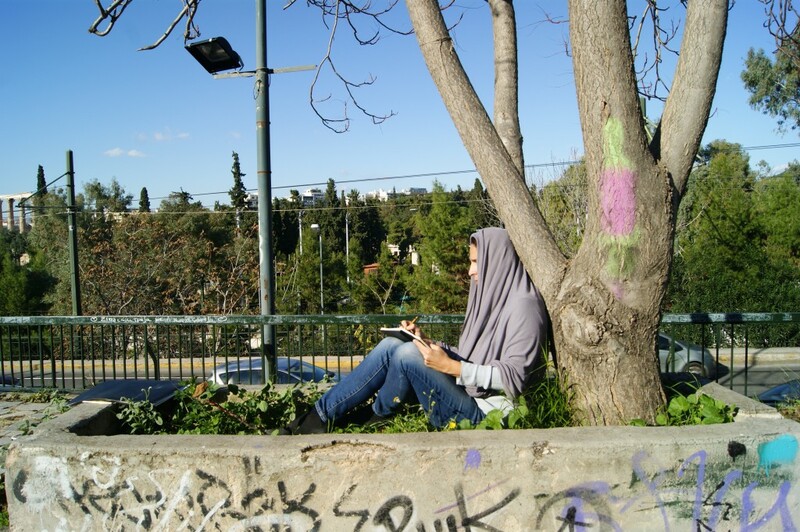 Aristotle Giannakouros and Hariklia Hari share their experience of the Ilissia forest in Athens. Both live nearby and incorporate the forest in their everydaylife activities: Aristotle accompanies his small daughter to school through the forest path, Hariklia walks her dog. These everyday small acts form a daily ritual. And can became a reverie. We can see its traces in the installation that consists of Sounds and Poems (A.G) and Microsculptures, Photos, Drawings and other Writings (H.H). “Sentimental Topography” is a work in progress by Hariklia Hari. It consists of episodes that narrate the authors experience in the landscape. In this particular installation at the Offices’ site, Hari is collaborating with Aristotle Giannakouros in a common work, sharing both their trivialities and their reveries. 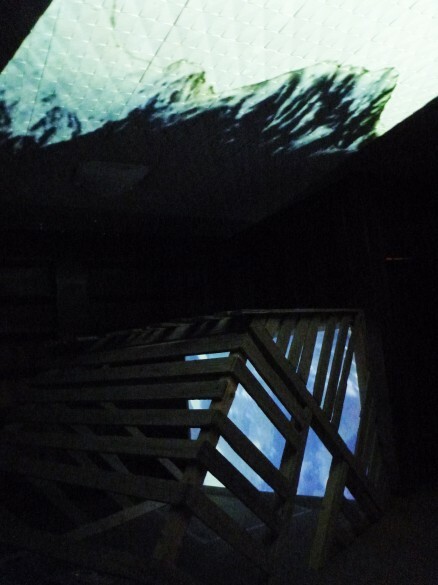 Sentimental Topography is set up on the Offices‘ site. It fits in as a “pause” between the previous exhibition (“Transparencies and the Sacred”) and the next (“Thoreau’s cabin”: upcoming site specific installation by Rika Krithara). At Transparencies and the Sacred we have witnessed the transformation of the abandoned site to a functional and emotional space. All artworks interacted to the site in a psychodynamic way; interacted with the personalities of the former owners, indicated the notions of enclosure and abandonment, and claimed a new dynamics of openness for it. In particular, the Cage incorporated objects and memories of the former office. It served as a heart of the fading space; still beating. The Cage will be overwritten by Cabin, an art work on the notion of habitation, togetherness and collectivity. From the Cage till the Cabin, from abandonment to rehabitation, Sentimental Topography provides a pause. During this pause we to experience the Office in its proximity to the forest; Go deep in the forest and deep in the Office. 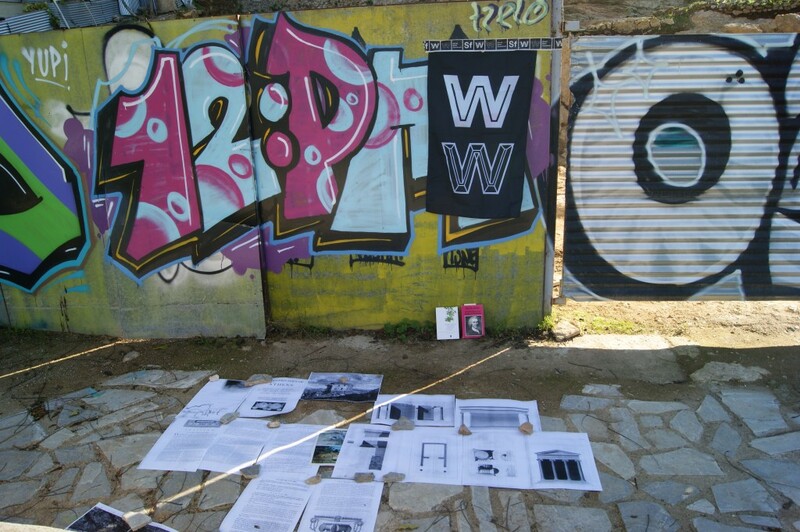 In “Urban Stories from the Center of Athens”, Microgeographies narrative unfolds in both “Arch_06 Lab” and “Void@1rst Floor”. These places are located almost door-to-door in Psyrri area at the center of Athens; an area and a community that undergoes gentrification. Void@1rst floor hosted the Action-Installation of the work in progress “The Neighborhood, The Inhabitants and their Stories” by Nomadic Architecture Network. In collaboration with local craftsmen. During the performance Mrs Joanna explained her work as a specialized ballet and dance shoe maker. She shared with us her experience of being and working at Psyrri, an area traditionally inhabited by leather and shoe experts and craftsmen. Nowadays Psyrri neighborhood undergoes gentrification and she is one of the few remaining leather craftsmen. After the performance there was a special presentation of the documentary “And the Hearts come from China”. The documentary is based on the local craftsmen and their stories. By Maria Damkalidi and Eleni Tzirtzilaki. Here is a text in greek, on the documentary “And the hearts come from China” by the authors. Με συνεργείο δύο ατόμων και τον απολύτως απαραίτητο εξοπλισμό, ξεκινήσαμε να ανακαλύψουμε το «δέρμα της πόλης» και τα κρυμμένα μυστικά και τις διαδρομές της γειτονιάς του Ψυρρή. Πρόκειται για δύο παράλληλες προβολές : H μια αφορά το «δέρμα της πόλης» μέσα απο περιπλανήσεις. Σοβάς ,τούβλα , άσφαλτος, πεζοδρόμια, εγκαταλειμμένα κτήρια , η επιδερμίδα της κατάληψης του θεάτρου Εμπρός, οι ταρατσες , οι κατασκευές με το ελενίτ, τα «σώματα δίχως σημασία»στην Αθήνα «της γυμνής ζωής» όπως των μεταναστών με τα καρότσια που κουβαλούν τα απομεινάρια απο τα σκουπήδια, των χρηστών ουσιών στα πεζοδρόμια. Περιπλανιόμαστε στους στενούς δρόμους και τις πλατείες της γειτονιάς όπου ο δημόσιος χώρος έχει καταληφθεί στο μεγαλύτερο μερος απο τραπεζοκαθίσματα, όπου όμως συναντάμε καθε λογής ανθρώπους να κυκλοφορούν σε μια καθημερινότητα του κέντρου της πόλης. Η άλλη προβολή αφορά αυτό που δεν φαίνεται, που είναι κρυμμένο στα εσωτερικά των κτιρίων, τα εργαστήρια, που θα ονομάζαμε «τοποθεσίες αντίστασης», στην κακή διαχείριση του τόπου και της μνήμης του, στο εύκολο χρήμα που τα κέντρα διασκεδασης έφεραν στη γειτονιά, μέσα απο ένα ιδιόμορφο gentrification, εκτοπίζοντας αρχικά-εξαφανίζοντας μεσα σε λιγα χρόνια πολλά από αυτά. Μιλούν οι τεχνίτες υποδηματοποιοί, μηχανουργοί, ξυλογλύπτες, οργανοποιοί, μοναδικοί δημιουργοί, δεξιοτέχνες που μέσα σε χώρους που βρίσκονται σχεδόν κρυμμένοι, σε υπόγεια, ορόφους, στα στενά της γειτονιάς του Ψυρρή συνεχίζουν με τα χέρια τους κόντρα στο χρόνο και στην κρίση, το δημιουργικό τους έργο. Καταγράφουμε τις ιστορίες τους, το πως βλέπουν τη γειτονιά να αλλάζει , πως αλλάζουν κι αυτοί μεσα στο χρόνο, το τελετουργικό της καθημερινότητάς τους, την επιθυμία τους να κάνουν καλά μια δουλειά ως αυτοσκοπό. Ρίχνουμε τη ματιά μας στον χώρο και στα εργαλεία τους, στα χέρια τους και στις δεξιότητές τους. Συχνά οι δεξιότητες φαίνεται να μεταβιβάζονται απο γενιά σε γενιά. Να συμβάλλουν ακόμη και τώρα στον επαναπροσδιορισμό μιας κατακερματισμένης κοινότητας. Συναντάμε νέους ανθρώπους που ξεκινάνε τώρα να μαθαίνουν μια τέχνη οπως οι μαθητές της σχολής υποδηματοποιών . Ο τίτλος προέρχεται απο τα λόγια του τεχνίτη κουτιών που αναμεσα στα άλλα φτειάχνει καρδιές –κουτιά , και που ανάμεσα στα άλλα μας είπε ότι «τώρα και οι καρδιές έρχονται απο τη Κίνα.» Τίτλος που αποκτά ιδιαίτερη σημασία στη συμερινή συνθήκη.